Stop Making Sense offers an original and compelling theory of music "from the perspective of the real" as this term is understood according to the Lacanian orientation in psychoanalysis. Specific examples and cases discussed include Freud's melophobia, or fear of music; Che Guevara's revolutionary a-rhythmia; John F. Nash's obsession with "Bach's Little Fugue"; Talking Heads and Asperger's syndrome/autism; Yoko Ono and the sense of "lack" in the Beatles; the role of "Imagine" in the murder of John Lennon; Brian Eno and the digital auto-generation of Freud's 'oceanic feeling'; Aphex Twin and the brain-dance of the hikikomori; and the utopian promise of Merzbow. 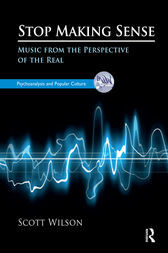 The first part of the book explains its theoretical and methodological underpinnings that are based in a reading of subjects and symptoms such as amusia. The second and third parts focus on contemporary examples that look at how music has become both a powerful locus of discontent and also a form of orientation in an age of generalized psychosis imposed by neoliberalism as a form of governance.